He swapped his cupcake for a candy bar. I swapped seats with my sister so she could see the stage better. I liked her blue notebook and she liked my red one, so we swapped. These example sentences are selected automatically from various online news sources to reflect current usage of the word 'swap.' Views expressed in the examples do not represent the opinion of Merriam-Webster or its editors. Send us feedback. A swap is an agreement between two parties to exchange a series of future cash flows. Swaps are financial agreements to exchange cash flows. Swaps can be based on interest rates, stock indices, foreign currency exchange rates and even commodities prices. Let's walk through an example of a plain vanilla swap, which is simply an interest rate swap in which one party pays a fixed interest rate and the other pays a floating interest rate. The party paying the floating rate "leg" of the swap believes that interest rates will go down. If they do, the party's interest payments will go down as well. The party paying the fixed rate "leg" of the swap doesn't want to take the chance that rates will increase, so they lock in their interest payments with a fixed rate. Company XYZ issues $10 million in 15-year corporate bonds with a variable interest rate of LIBOR + 150 basis points. LIBOR is currently 3%, so Company XYZ pays bondholders 4.5%. After selling the bonds, an analyst at Company XYZ decides there's reason to believe LIBOR will increase in the near term. Company XYZ doesn't want to be exposed to an increase in LIBOR, so it enters into a swap agreement with Investor ABC. Company XYZ agrees to pay Investor ABC 4.58% on $10,000,000 each year for 15 years. Investor ABC agrees to pay Company XYZ LIBOR + 1.5% on $10,000,000 per year for 15 years. Note that the floating rate payments that XYZ receives from ABC will always match the payments they need to make to their bondholders. 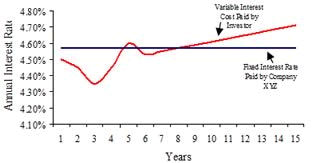 The investor is betting that the variable interest rate will go down, lowering his or her interest cost, but the interest payments from Company XYZ will be the same, allowing a gain (i.e. arbitrage) on the difference. Interest rate swaps have been one of the most successful derivatives ever introduced. They are widely used by corporations, financial institutions and governments. According to the Bank for International Settlements (BIS), the notional principal of over-the-counter derivatives market was an astounding $615 trillion in the second half of 2009. Of that amount, swaps represented over $349 trillion of the total. What made you want to look up swap? Please tell us where you read or heard it (including the quote, if possible).